"Hurt" is a song by American industrial rock band Nine Inch Nails from their second studio album, The Downward Spiral (1994), written by band leader Trent Reznor. It was released on April 17, 1995 as a promotional single from the album. The song received a Grammy Award nomination for Best Rock Song in 1996, but ultimately lost to Alanis Morissette's "You Oughta Know". In 2002, "Hurt" was covered by Johnny Cash to commercial and critical acclaim; it was one of Cash's final hits released before his death, and the related music video is considered one of the greatest of all time by publications such as NME. Reznor praised Cash's interpretation of the song for its "sincerity and meaning", going as far as to say "that song isn't mine anymore." The song includes references to self-harm and heroin addiction, although the overall meaning of the song is disputed. Some listeners contend that the song acts as a suicide note written by the song's protagonist, as a result of his depression, while others claim that it describes the difficult process of finding a reason to live in spite of depression and pain and does not have much to do with the storyline of The Downward Spiral. The music video for Nine Inch Nails' original version of "Hurt" is a live performance that was recorded before the show in Omaha, Nebraska, on February 13, 1995, and can be found on Closure and the DualDisc re-release of The Downward Spiral. The audio portion appears on the UK version of Further Down the Spiral. The version released on Closure differs slightly from the video originally aired on MTV. In addition to using an uncensored audio track, the Closure edit shows alternate views of the audience and performance at several points during the video. To film the video, a scrim was dropped in front of the band on stage, onto which various images, such as war atrocities, a nuclear bomb test, survivors of the Battle of Stalingrad, a snake staring at the camera, and a time-lapse film of a fox decomposing in reverse, were projected, adding visual symbolism to fit the song's subject matter. A spotlight was cast on Reznor so that he can be seen through the images. Compared to the live renditions performed on future tours, this version most resembles the studio recording with its use of the song's original samples. There are also official live recordings on the later releases And All that Could Have Been and Beside You in Time. Each version features distinct instrumentation by the varying members of the band in the respective eras. 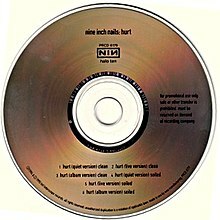 During the Dissonance tour in 1995, when Nine Inch Nails opened for David Bowie, Bowie sang "Hurt" in a duet with Reznor, backed by an original melody and beat. This served as the conclusion to the dual act that began each Bowie set. During the Fragility tours, the progression was performed by Robin Finck on acoustic guitar rather than on piano. Since the 2005–06 Live: With Teeth tour, Nine Inch Nails has been playing "Hurt" in a more toned-down style, featuring only Reznor on keyboard and vocals until the final chorus, when the rest of the band joins in. The song was brought back to its original form during the Lights In The Sky tour in 2008, before returning to the toned down style on the 2009 Wave Goodbye tour. The song was used at the end of "The Wedding Squanchers", the final episode of the second season of the animated series Rick and Morty. The original version was played near the end of The Hangover III and the Johnny Cash version was played as karaoke by Ken Jeong earlier in the film. (2003) "God's Gonna Cut You Down"
In 2002, Johnny Cash covered the song for his album, American IV: The Man Comes Around. Its accompanying video, featuring images from Cash's life and directed by Mark Romanek, was named the best video of the year by the Grammy Awards and CMA Awards, and the best video of all time by NME in July 2011. The single contains a cover of Depeche Mode's "Personal Jesus" as a B-side. Cash's cover of the song had sold 2,148,000 downloads in the United States as of March 2017. When Reznor was asked if Cash could cover his song, Reznor said he was "flattered" but worried that "the idea sounded a bit gimmicky." He became a fan of Cash's version, however, once he saw the music video. I pop the video in, and wow... Tears welling, silence, goose-bumps... Wow. [I felt like] I just lost my girlfriend, because that song isn't mine anymore... It really made me think about how powerful music is as a medium and art form. I wrote some words and music in my bedroom as a way of staying sane, about a bleak and desperate place I was in, totally isolated and alone. [Somehow] that winds up reinterpreted by a music legend from a radically different era/genre and still retains sincerity and meaning – different, but every bit as pure. The music video was directed by former Nine Inch Nails collaborator Mark Romanek who sought to capture the essence of Cash, both in his youth and in his older years. In a montage of shots of Cash's early years, twisted imagery of fruit and flowers in various states of decay, seem to capture both his legendary past and the stark and seemingly cruel reality of the present. According to literature professor Leigh H. Edwards, the music video portrays "Cash's own paradoxical themes". It had been closed for a long time; the place was in such a state of dereliction. That's when I got the idea that maybe we could be extremely candid about the state of Johnny's health, as candid as Johnny has always been in his songs. When the video was filmed in February 2003, Cash was 71 years old and had serious health problems. His frailty is clearly evident in the video. He died seven months later, on September 12; his wife, June Carter Cash, who is shown gazing at her husband in two sequences of the video, had died on May 15 of the same year. In July 2011, the music video was named one of "The 30 All-TIME Best Music Videos" by Time. It was ranked the greatest music video of all time by NME. The house where Cash's music video for "Hurt" was shot, which was Cash's home for nearly 30 years, was destroyed in a fire on April 10, 2007. The Johnny Cash cover was given the Country Music Association award for "Single of the Year" in 2003. It ranked as CMT's top video for 2003, No. 1 on CMT's 100 Greatest Country Music Videos the following year, and No. 1 on the Top 40 Most Memorable Music Videos on MuchMoreMusic's Listed in October 2007. As of March 2016, the single occupies the number nine spot on Rate Your Music's Top Singles of the 2000s. The song is also Cash's sole chart entry on the Billboard Modern Rock Tracks chart, where it hit No. 33 in 2003. In June 2009, the song was voted No. 1 in UpVenue's Top 10 Best Music Covers. "Hurt" was nominated for six awards at the 2003 MTV Video Music Awards, winning for Best Cinematography. With the video, Johnny Cash became the oldest artist ever nominated for an MTV Video Music Award. Justin Timberlake, who won Best Male Video that year for "Cry Me a River", said in his acceptance speech that the MTV Video Music Award for Best Male Video should have gone to Cash. The music video won the 2004 Grammy Award for Best Short Form Music Video. In July 2009, Cash's version of 'Hurt' was voted in at number 60 on Triple J's Hottest 100 of all time, Australia's largest music poll. Rolling Stone ranked Johnny Cash's 'Hurt' as number 15 of the 50 best songs of the decade (RS 1094/1095). In May 2010, 'Hurt' was voted the fifth most influential video of all time by MySpace. CMT had it ranked as the number 2 song of the decade on their show of November 13 'Songs of the Decade'. In October 2011, NME placed it at number 35 on its list "150 Best Tracks of the Past 15 Years". In a 2014 survey conducted by the BBC the UK public voted the Johnny Cash version the second greatest cover version of all time. The Johnny Cash version has appeared in several films, documentaries and TV shows including Colombiana, Criminal Minds, Smallville, Inside I'm Dancing, Person of Interest and Why We Fight in addition to the teaser trailer for the Marvel film Logan. James Mangold, the director of Logan had previously directed the Johnny Cash biopic Walk the Line. The song does not appear in the film proper, with the film instead opting to use Cash's "The Man Comes Around" over the ending credits. ITV Sport used this version in a montage of England's exit from the 2006 FIFA World Cup after losing a penalty shoot out against Portugal. One montage scene showed David Beckham visibly shaken and emotional for not being able to play due to an injury during the match, being in tears at one point . Sky Sports also used a section of this version in a montage of the 2013–14 Ashes series following England's 5-0 defeat by Australia. During the edition of November 14, 2005 of WWE Raw, WWE used the song for their tribute show dedicated to Eddie Guerrero following his death from heart failure. Leona Lewis covered the song on her 2011 EP, Hurt: The EP. The cello duo 2Cellos released a rendition of the song on its self-titled 2011 album, based on Johnny Cash's version. Sevendust's live cover of the song was featured on their 2004 live album, Southside Double-Wide: Acoustic Live. Gregorian released a Gregorian chant-inspired cover of the song on its 2004 album, The Dark Side. Eddie Vedder made a live cover version in 2008, referencing it as "borrowed from Chicago". 2012 Lucinda Williams covered the Cash version of the song in the concert and accompanying live album We Walk the Line. Eric Whitacre wrote a choral version of the song, composed in 2013-14 and released as a single in 2017. 2019 Mumford & Sons performed a cover version as a ballad in their show at Quicken Loans Arena in Cleveland, Ohio, Trent Reznor's origin city. ^ "Geoff Rickly interviews Trent Reznor". Alternative Press. June 26, 2004. Retrieved August 9, 2018. ^ Sinacola, Dom (December 17, 2015). "I Will Make You Hurt: Grief in Rick and Morty, The Leftovers and Heart of a Dog". Paste. Retrieved November 15, 2016. ^ "Top RPM Rock/Alternative Tracks: Issue 9238." RPM. Library and Archives Canada. Retrieved December 25, 2016. ^ "Nine Inch Nails Chart History (Radio Songs)". Billboard. Retrieved August 21, 2013. ^ "Nine Inch Nails Chart History (Alternative Songs)". Billboard. Retrieved December 25, 2016. ^ "NME names Johnny Cash's 'Hurt' the greatest music video of all time". NME. July 5, 2011. Retrieved December 27, 2011. ^ a b Bjorke, Matt (March 22, 2017). "Top 30 Digital Single Sales Chart: March 22, 2017". Roughstock. ^ Alternative Press No. 194. September 2004. ^ "Director Mark Romanek Tackles 'Never Let Me Go'". Fresh Air. September 23, 2010. Retrieved October 27, 2010. ^ Binelli, Mark (February 20, 2003). "Johnny Cash Makes 'Em Hurt". Rolling Stone. Retrieved January 18, 2016. ^ "Johnny Cash, 'Hurt' & Trent Reznor". Stagepass News. Retrieved December 11, 2011. ^ Levy, Glen (July 28, 2011). "The 30 All-TIME Best Music Videos - Johnny Cash, Hurt". Time. Retrieved August 19, 2011. ^ "100 Greatest Music Videos". NME. Retrieved December 15, 2012. ^ "Fire destroys Johnny Cash home". BBC News. April 11, 2007. Retrieved August 23, 2009. ^ "Top Singles of the 2000s". Rate Your Music. Retrieved September 17, 2009. ^ "UpVenue's Top 10 Best Music Covers". Retrieved August 23, 2009. ^ "Johnny Cash - Memories Shared". Songstuff. Retrieved June 27, 2013. ^ "mtv.com "September 12, 2003 Johnny Cash Remembered By Justin, Bono, Trent Reznor, Others"". Retrieved October 30, 2016. ^ "Sky News 03/05/2010". News.sky.com. Archived from the original on July 13, 2012. Retrieved December 11, 2011. ^ "150 Best Tracks of the Past 15 Years". Nme.Com. Retrieved December 11, 2011. ^ "Pet Shop Boys' Always On My Mind tops cover version vote". BBC News. October 27, 2014. Retrieved December 10, 2018. ^ "Inside I'm Dancing (2004) Soundtracks". October 15, 2004 – via IMDb. ^ "Johnny Cash Soundtracks First Trailer for the Depressing New Wolverine Movie - SPIN". October 20, 2016. ^ "Portugal sink England on Penalties". Retrieved September 12, 2014. ^ matt smith (January 7, 2014). "Sky Ashes Montage 2013/14" – via YouTube. ^ Theundertakerfan85 (October 19, 2009). "Eddie Guerrero Tribute Show in RAW part 1" – via YouTube. ^ "Chart Track: Week 45, 2003". Irish Singles Chart. Retrieved October 31, 2016. ^ "Johnny Cash: Artist Chart History". Official Charts Company. Retrieved October 31, 2016. ^ "Johnny Cash Chart History (Alternative Songs)". Billboard. Retrieved August 21, 2013. ^ "Johnny Cash Chart History (Hot Country Songs)". Billboard. Retrieved August 21, 2013. ^ "Norwegiancharts.com – Johnny Cash – Hurt". VG-lista. Retrieved October 31, 2016. ^ "Offiziellecharts.de – Johnny Cash – Hurt". GfK Entertainment Charts. Retrieved October 31, 2016. ^ "ARIA CHART WATCH #392". auspOp. October 29, 2016. Retrieved October 29, 2016. ^ "Lescharts.com – Johnny Cash – Hurt" (in French). Les classement single. Retrieved October 31, 2016. ^ "Official Scottish Singles Sales Chart Top 100". Official Charts Company. Retrieved November 1, 2016. ^ "Gold-/Platin-Datenbank (Johnny Cash; 'Hurt')" (in German). Bundesverband Musikindustrie. Retrieved July 10, 2018. ^ "Italian single certifications – Johnny Cash – Hurt" (in Italian). Federazione Industria Musicale Italiana. Retrieved August 27, 2018. Select "2018" in the "Anno" drop-down menu. Select "Hurt" in the "Filtra" field. Select "Singoli online" under "Sezione". ^ "British single certifications – Johnny Cash – Hurt". British Phonographic Industry. Retrieved July 10, 2018. Select singles in the Format field. Select Platinum in the Certification field. Type Hurt in the "Search BPI Awards" field and then press Enter. ^ "Johnny Cash – Hurt (Video Single)". Recording Industry Association of America. Retrieved July 10, 2018. ^ "Johnny Cash – Hurt (Physical Single)". Recording Industry Association of America. Retrieved July 10, 2018. ^ O'Brien, Jon. "2Cellos - 2Cellos". Allmusic. Retrieved January 3, 2016. ^ Loftus, Johnny. "Sevendust - Southside Double-Wide: Acoustic Live". Allmusic. Retrieved January 3, 2016. ^ "Gregorian - The Dark Side". Allmusic. Retrieved January 3, 2016. ^ "Pearl Jam covering Jonny Cash - Hurt (m.youtube.com)". Retrieved April 11, 2017. ^ "Hurt". Eric Whitacre. December 2, 2013. Retrieved September 28, 2018. ^ "Video: Mumford & Sons covern Nine Inch Nails „Hurt"". March 11, 2019. Retrieved March 21, 2019. Edwards, Leigh H. (2009). Johnny Cash and the Paradox of American Identity. Indiana University Press. ISBN 0253220610. "Digital Tributes Honor Virginia Tech Victims". KDKA-TV. April 18, 2007. Archived from the original on December 22, 2007. Anthony DeCurtis (June 7, 2005). "In Other Words: Trent Reznor". Rolling Stone.